Discussion in 'Apple TV and Home Theater' started by nebulight, Nov 9, 2012. A little background... I was using Boxee alpha back in the day and I was ripping all my DVDs to .m4v H264 and AC3 audio because at the time I was using a Mac Mini with Boxee and the mac mini could not pass AAC audio to my over optical to my receiver. I ditched the mac mini when the Boxee Box came out and everything was fine until the Boxee Box started crashing left and right. I did a restore and nothing was resolved and my wife was getting fed up so I caved and bought an Apple TV. We also moved and no longer have surround sound (just the TV) and I found out that the Apple TV doesn't decode the AC3 and just passed it to the TV. However I have an older Samsung LCD that doesn't decode the AC3 audio so now I have to reencode my entired collection. However since it's in m4v I think I can just use Subler as I have to pass it through there anyway to add cover art and descriptions. As you can see on the action I can convert it to AAC then do my normal lookup to add the info and cover art. The nice part about this is I can drag multiple items at a time to batch the conversions and add them to a Queue. As you can see, there is no option to convert the audio as it doesn't give you the option. I have a work around which is to go to File/New then add tracks and pick the file. However the problem with doing it this was is it would take forever! I have 279 movies and thousands of tv show episodes that I've manually ripped so to add all the files one by one would take forever. If I could batch it, I'll just let it run while I'm at work and sleeping. However I can't batch it. 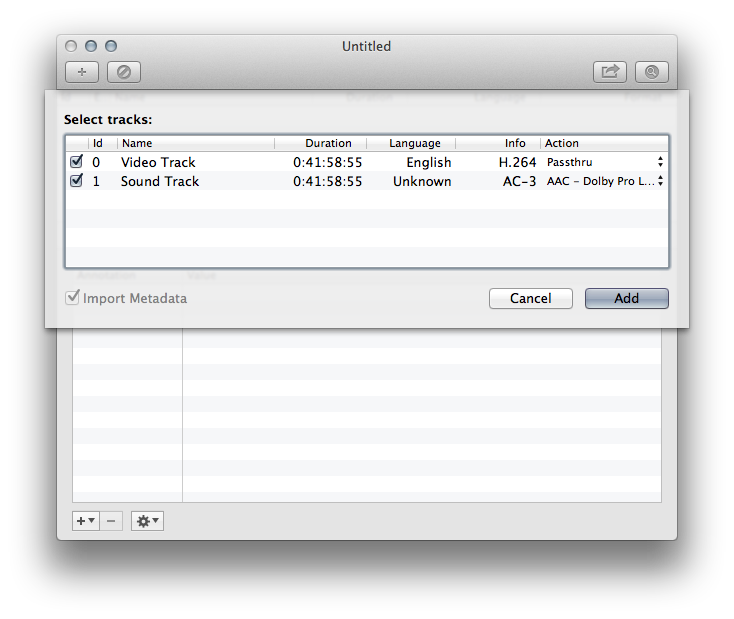 Set your audio preferences to convert AC3 to AAC. That has already been done, all that does is set the default action in the first picture to convert. It just seems to be my m4v files that are giving me the problem because the tracks don't even appear like the first photo. I'm afraid Subler can't be used in batch mode for this kind of conversion. However, (the beta AND non-free version of) MP4Tools can: I've tested it and it works just fine with batch conversion. Let me know if you need further help with all this. Yes, it's only with MKV's that the first dialog is displayed, not with the output format of Subler. Thanks Menneisyys2. I'll pick up mp4tools and give this a shot. However if there was a way to batch it with subler, it would save me a step because I'll still have to put it through Subler to add the cover art and file info I'll have to a test run to see if it makes sense for me to do it twice or just manually do each file with subler. Any help? Thanks! Also, it's adding a second .m4v to the end. Not a big deal, but do you know why? There seems to be a bug with teh latest b15 version (did you update to it? ): the first file converted upon drag-and-dropping a bunch of files to it won't have the added AAC audio track, only all the other files (with the settings I've shown). That is, make sure you duplicate the first file OR pass a dummy file as the first in the filelist you drag from Finder to MP4Tools. The rest will have both (AC3 + AAC) audio tracks, it's only the first that won't. To not to overwrite the original (source) file. You can safely remove the original extension from the filename. I'm not using MKVTools, I'm using MP4Tools. And I was just running the latest stable version (3.1.4). However it looks like the video track was messed up as well as you can see in my above screen shot. I'll try to download the beta and see if I have any better luck. 1. Never use the non-beta version of these apps. 2. I've mentioned MKVTools because I referred to that app in the linked article as having exactly the same problem. And if I open the file with Subler it looks like all the tracks are there EXCEPT the subtitle track. I actually took this file and ran it through subler and it added the cover art and info fine, but it still is hung in MP4tools. This is an issue as the reason I wanted to use MP4tools was for the batch abilities. Have you ran into anything like this? Also, do you know where I can find previous beta versions? Maybe I can try a different version. I figured out my issue. 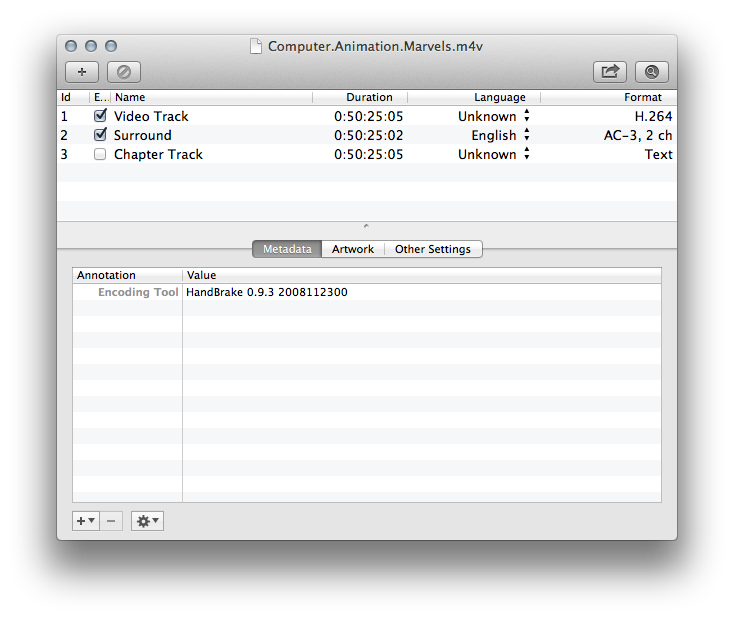 Handbrake put the chapters in the file and MP4tools thought it was a subtitle track. If I removed the subtitle track everything worked out fine. Be sure to let the developer know what happened as he is looking for feedback on the beta to work out exactly those type of bugs. Yep, already emailed him. Thanks!